One of my favorite weekend rituals is hitting the local farmers’ market, and San Francisco has no shortage, with one in nearly every neighborhood. This weekend #SundaySupper is all about farmers’ markets and enjoying the local bounty–T.R. over at Nobody Likes Crumbley Cookies is hosting. 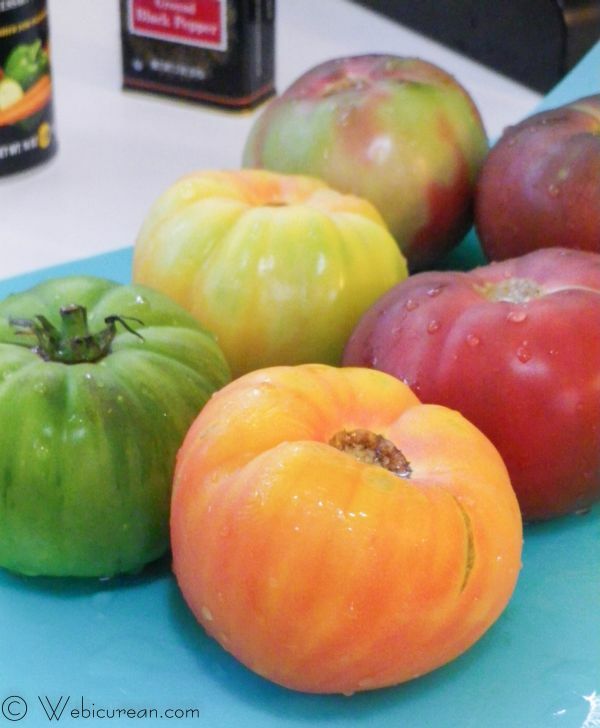 Of course, the farmers’ market is the best place to get heirloom tomatoes, so today, I’m stuffing some for you. I’m sure you’ve noticed the whole farm to table/locavore scene is quite trendy right now–I mean, who wouldn’t love getting the freshest produce straight from the farm? Farmers’ markets and road-side stands are a valuable resource, but it’s not all about the food.There’s a whole social scene, and that’s what I love most. Maybe I appreciate it more living in a big city. The pace is pretty laid back with folks milling around, sampling produce and interacting with one another. You might run into a neighbor. You might make a new friend. Virtually everyone is in a good mood, and there’s a real sense of community, even when you’re surrounded by total strangers. That’s the real magic of a farmers’ market. If you’re not sure where to find a farmers’ market in your area, the USDA has set up a searchable National Farmers Market Directory–just enter your zip code and hit search. 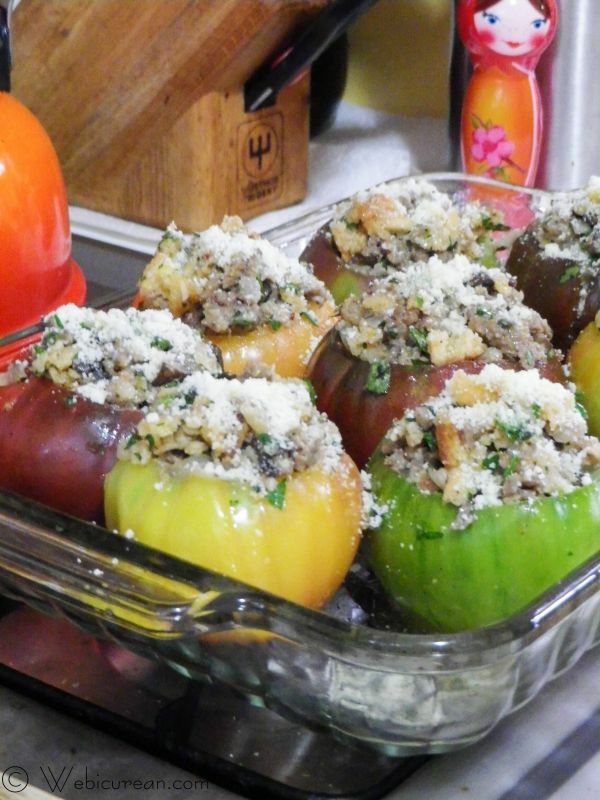 In the meantime, let’s get these stuffed heirloom tomatoes in the oven. This recipe was adapted from one I found in a Williams-Sonoma catalog several years ago. Try to find tomatoes that are similar in size. Wash, then core the tomatoes, scooping out all the seeds. Salt and pepper inside, then place upside down on a plate to drain. While the tomatoes are resting, sautÃ© the onion and garlic in olive oil. Then add the mushrooms, cooking until softened. Then add the sausage and pepper flakes, sauteing until the sausage is thoroughly cooked. 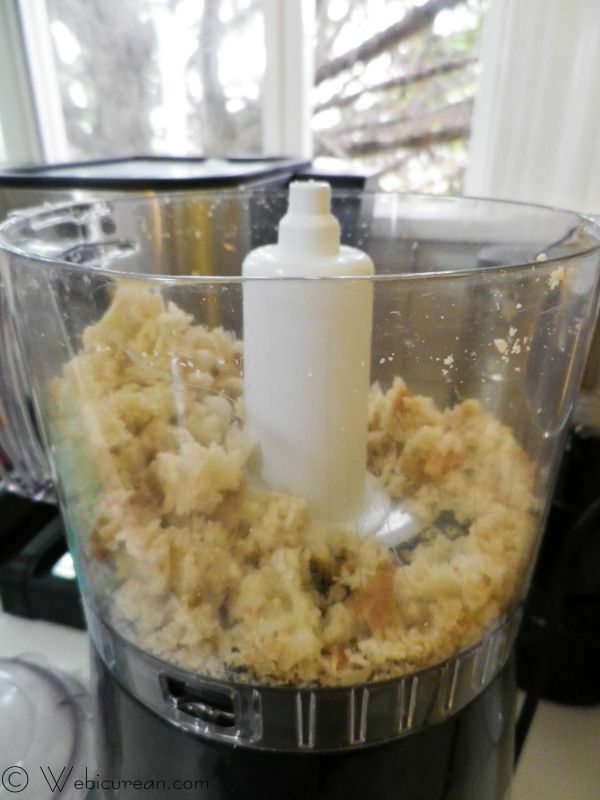 While the sausage is cooking, make the bread crumbs–I toasted about four slices of Pugliese, then ran them through the food processor. Using fresh bread crumbs makes all the difference in the world! Once the sausage is cooked, remove from heat and drain off a bit of the fat. Let the sausage mixture cool for a few minutes, then stir in the bread crumbs and 1/2 cup of the cheese along with the herbs. Arrange the tomatoes in a large baking dish, then stuff generously with the sausage mixture.Â Sprinkle with the remaining Parmesan cheese and drizzle a little olive oil over the tops. Bake this for about 30 minutes or until golden. Let these cool for a few minutes before serving. 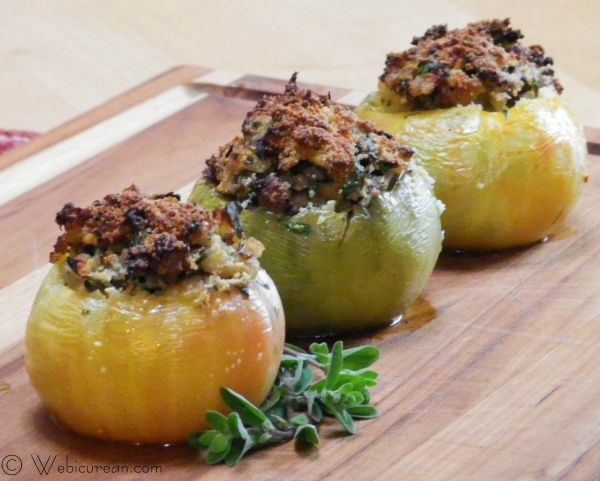 Juicy heirloom tomatoes are stuffed with a combination of mushrooms, Italian sausage, and fresh breadcrumbs to make a simple and light meal. Core tomatoes, scooping out the seeds with a spoon. Season the insides with salt and pepper, and place tomatoes on a plate, cut side down. In a saute pan over medium-high heat, saute the onion in the olive oil until translucent. 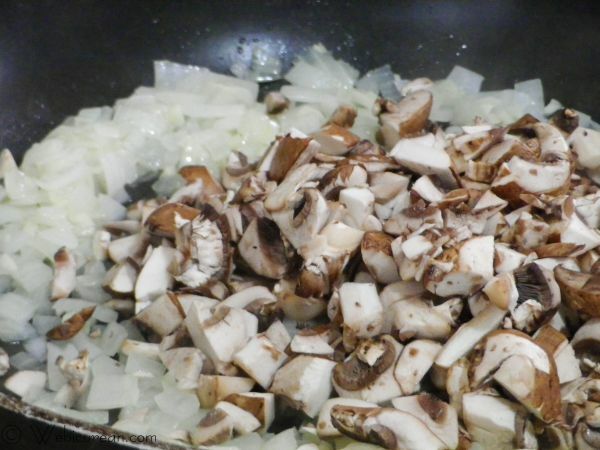 Add the garlic and mushrooms, and saute for 5 minutes, until the mushrooms soften. Then add the sausage and red pepper flakes. Cook, breaking the sausage into small pieces, until done (about 5 minutes). Remove from heat and cool about 10 minutes. 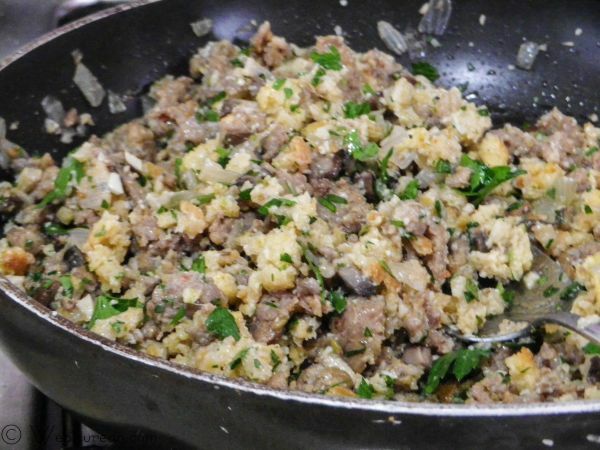 Stir the marjoram, bread crumbs, Â½ cup cheese, and the parsley into the sausage mixture. Stuff the tomatoes with the filling and place in a baking dish. Sprinkle tomatoes with the remaining cheese, and drizzle a bit of olive oil over the tops. Bake 30-35 minutes or until tops are golden brown. Let stand 5 minutes before serving. Makes 8-10 stuffed tomatoes. Kitchen Sink Vegetable Curry fromÂ What Smells So Good? Join the #SundaySupper conversation on twitter today!Â We tweet throughout the day and share recipes from all over the world. Our weekly chat starts at 7:00 pm EST. Follow the #SundaySupper hashtag and remember to include it in your tweets to join in the chat. 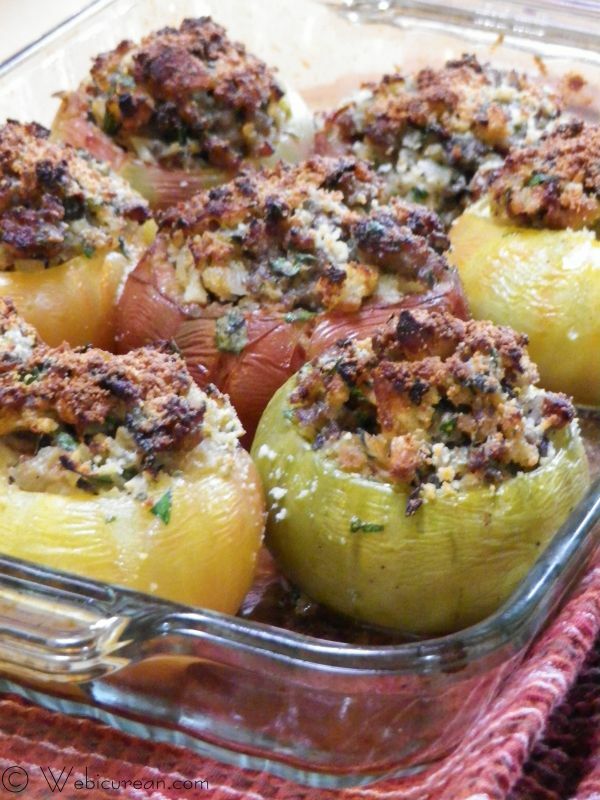 Check out our#SundaySupper Pinterest boardÂ for more fabulous recipes and food photos. Oh wow, these sound fabulous!! I bet the sausage makes them so flavorful. It does, and I’m not normally a big fan of Italian sausage… but I’m loving these even more than stuffed bell peppers–and the tomatoes just melt in your mouth!